Artistry, imagination, excellence and passion are the cornerstones of our personal care manufacturing and formulation methodology. Since 1997, Vitelle Labs has specialized in the creation and production of premium skin and body care, employing cutting-edge ingredients which deliver real benefits to the end user. We believe that to be truly special a product is required to achieve more than one function. By offering dynamic formulations, with cascading benefits, our customer can more effectively market their products. We believe to achieve the top tier of functionality you can’t cut corners on quality and efficacy as they are both essential to a superior finished product. 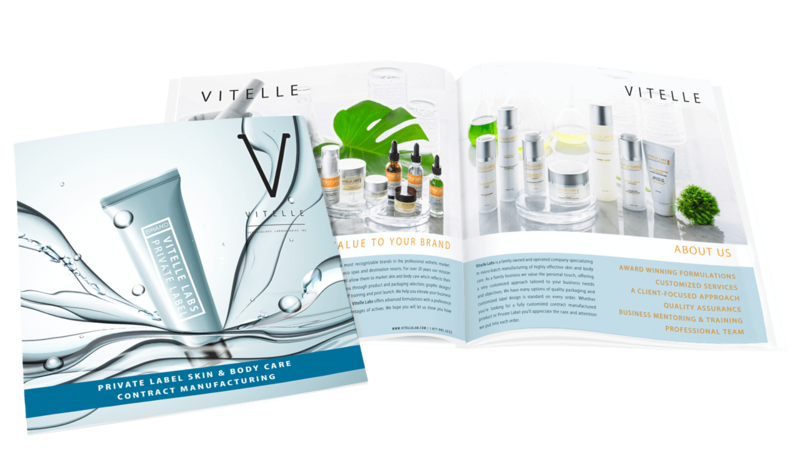 As a result Vitelle has elevated market perception of what results a private label product can offer and set a new standard within the professional skincare market. For those clients who are looking for something that is distinctively their own, we are here to listen to your needs and help you create a formula that is truly unique. With expertise from both aesthetic and scientific backgrounds, our dedicated Research and Development team will guide you through an inception process which will help you navigate the plethora of myths and misinformation which can often accompany skin care ingredient marketing. Our goal is to help you to create at a highly functional product that will be well recieved commercially, yet possess evidenced based benefits which result from scientific validation. Once you approve your prototype and we have completed our standard stability and preservative testing you may begin to order your product. Custom manufacturing minimums begin at 20 liters for most products, with a batching potential to 400L per run. Custom products may be purchased in any of our standard packaging options so you can add them to existing private label collections if desired. We can also work with client supplied packaging should you purchase directly from your own suppliers. Our products are manufactured in accordance with GMPC with reference to: ISO2217:2007(E) – Cosmetics – guidelines on good manufacturing practices. Every product we manufacture is researched and tested by our development team before it is released for sale. That team consists of Estheticians, Cosmetic Chemists and skin care consumers. Hands-on and treatment room testing is conducted to refine the at-home and clinical applications of each formula. As a cruelty-free manufacturer, we test only on human volunteers and we never test on animals. Vitelle has a long-standing commitment to conducting business in a manner which complies with the highest legal and ethical standards. Compliance and ethical behavior are part of our core values which apply to all employees and associates and offer specific guidance of our company’s expectations.